The casualty toll in the attack was announced by the Prime Minister Ahmet Davutoglu to a news conference in Ankara. There are concerns the death toll could rise, the Interior Ministry said in a statement earlier. "We call on everyone to stand together and remain calm in the face of this terrorist attack which targets the unity of our country," the ministry added. "I saw more than 20 bodies. I think the number of wounded is more than 50. They are still being put into ambulances," a witness told Reuters by telephone shortly after the blast. "Ambulances and private cars are picking up the wounded. Many were killed - 20 or 30. I am going to the hospital to help out," Adham Basho, a local politician, also said. It is not immediately clear what caused the blast in the town, some 10km (6.2 miles) from the Syrian border town of Kobani, which was the scene of surprise Islamic State attacks that killed more than 200 people last month. 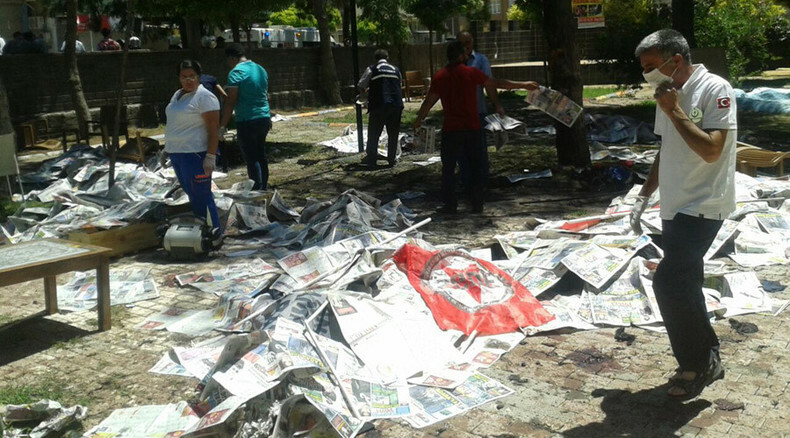 Turkiyegazetesi.com reports it appears to have been a cluster bomb explosion. Two senior Turkish officials told Reuters they have received evidence saying it was a suicide blast carried out by Islamic State militants. "Our initial evidence shows that this was a suicide attack by the Islamic State," one of the officials said on condition of anonymity. Another official told Reuters that Islamic State appeared to have been responsible and that the Suruc blast was "retaliation for the Turkish government's efforts to fight terrorism." “We think the attacker was a woman ... preliminary findings show that she was acting on her own,” the district governor of Suruc, Abdullah Ciftci told BBC Turkish. The possibility that IS was in charge of the explosion was heightened by “the fact that it's a suicide attack,” the official added. The unconfirmed Hurriyet report also said the attacker was a woman, and that she was 18 years old. The theory of a suicide bomber being behind the blast has also appeared in Turkish media. According to HDP (Peoples' Democratic Party) deputy Leyla Güven, it was “a big massacre” and the “probability of a suicide bomber is very high." The explosion targeted at least 300 young people of the Socialist Youth Associations Federation (SGDF), who had gathered in Amara Culture Center, Turkish media say. The young people were reportedly going to join a summer expedition to help rebuild Kobani. "There was a very violent explosion, we shook. There was a conference happening," Mahmut Boke, a municipal worker in Suruc, told Reuters by telephone. Suruc Municipality posted on Twitter that “emergency blood” is need following the explosion. The hashtag #SuruçtaKatliamVar (There is a massacre in Suruç) has appeared on Twitter following the tragedy. It has been retweeted about 12,000 times so far, according to topsy.com. Russian President Vladimir Putin sent a telegram with condolences to his Turkish counterpart Recep Tayyip Erdogan over the Suruc attack, stressing that “struggle against terrorism requires active coordination of efforts by the international community,” the Kremlin press service said. Suruc is home to about 57,000 residents. A blast caused by a car bomb also hit the neighboring town of Kobani, the Syrian Observatory for Human Rights said. It reportedly targeted a checkpoint of the Kurdish YPG militia. 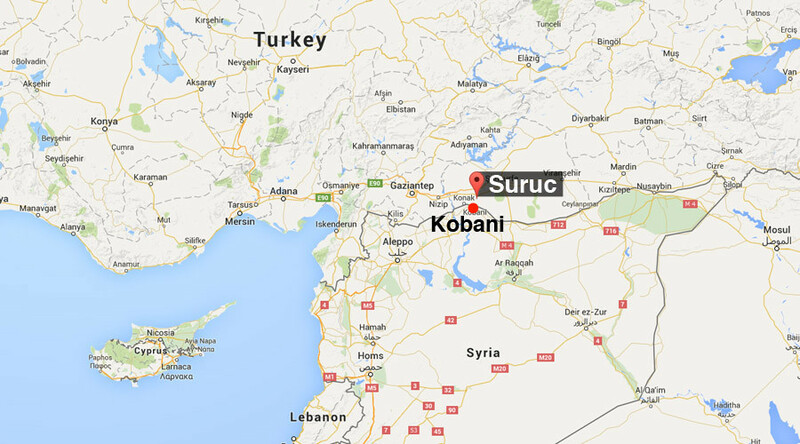 It’s not yet clear if the explosions in Suruc and Kobani are linked.